I do genealogy research. This hobby brings me to many remote cemeteries. Often when I go into any cemetery I feel a welcoming by its inhabitants. It’s just a feeling I get as I walk amongst the headstones. I always make sure to introduce myself when I arrive and bid them restful peace when I leave. After all, I am coming into their home uninvited. Recently I visited a very old cemetery. 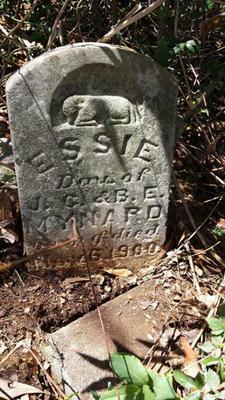 On this occasion my mission was to find and photograph the headstone of a baby girl, “Essie” who had been born and died in 1909. As I walked the cemetery my heart was heavy as I observed the condition of many of the headstones. Monuments erected out of honor and love, carved for eternal identification - now rest anonymously. Broken stones, scattered, knocked over or face down. Their final resting places, once under cover of youthful trees have been assaulted by broken branches. Others saved from broken limbs their graves and flowers once watered by the tears of family have been replaced by thick weeds and thorny bushes. This would be no easy task, I sadly realize, but I intended to find Essie. Finding the children’s area was a relief and disappointment. The small grouping of weathered cedar planks had long lost their engravings. I thought of their parents gripped with despair burying their babies. I wondered if their parents were here also. Had they moved away and left their cherished little ones here all alone? As I pushed aside bushes and dug into empty spaces where I imagined Essie might be my investigative journey took me farther and farther away from the gravestones. I explored the entire cemetery, including its perimeter. I even ventured into the adjoining pasture and into the yard of the abandoned house next door. Still no Essie. I was deflated; she was not going to be found. As I opened the car door to put my camera inside, as is my custom, I turned to bid my “friends” goodbye. Suddenly, in the distance I saw a shiny reflection bouncing from the farthest right of the cemetery properly line. There were no headstones there I could see, just clumps of bushes. I had already walked that area! As I stood watching the persistent dancing light I grabbed my camera and walked toward the strange light. A few dozen footsteps down the length of the cemetery the light suddenly disappeared. Chalking the experience off I decided to turn back and head to my car. As I did my eyes fell upon one overgrown hedge. Through the thick cover was a small headstone whose front was covered in leaves and a branch. I laughed to think it might be Essie. As I pushed the vines and thorns away her name jumped off the headstone. IT WAS ESSIE. I had passed by Essie twice and if not for the dancing light guiding me back to the area, I never would have found her! I quickly pulled the branches off of her and pushed the leaves away. I then sat and visited with her for a while, took a photograph of her headstone and said goodbye. Welcome to Haunted Alabama. Hello, I came across your story about finding Essie. She was my 2nd great aunt. How amazing. I am not sure when you wrote this. I am an researching my family tree.